The title says it all. Yes, now airing on comcast, “The Kwamedy Hour“. It’s supposedly called “real talk” per Kwame Kilpatrick’s media team, which solicits nothing but laughter from the general public. After all, how can dude with 8 felony indictments be taken seriously? For REAL? Right, they can’t! So instead of resigning, which is what everyone keeps asking him to do, Kwame now spends more public time and money starring in his own talk show. He should have just named this ridiculous media display “TRUE TALK”; admitted his guilt and resigned. Now THAT would have been a genuine public service and a wise use of broadcast time. But no, it gets even sillier. Guess who is the featured speaker on his very first show? Monica Conyers. And the “Kwame Sutra” is here. Truly, this sort of communication wholly inappropriate and out of order. What a shameful embarassment for Detroiters who are and will continue paying the price for this Mayor’s misbehaviors, which included his cell phone bill. Not the kind of activity people should be paying for with their tax dollars. Article recapping these explicit messages here. 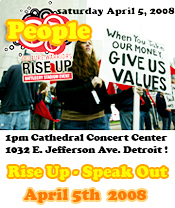 Kwame Kilpatrick is aware he can no longer sham the world but he will still keep trying! After these messages were released Tuesday, he went on all the local news channels saying they are “just a hoax, they not mine”. Can you believe it?! Hilarious. Perhaps equally egregious however, is the fact that Kwame Kilpatrick has also scammed the people yet AGAIN by making taxpayers pay for his legel defense. Attorney James Burdick who represents Kwame Kilpatrick in the text message scandal was awarded a $24,500.00 contract – just $500.00 below the amount requiring City Council approve it. Since it was below the limit, the law department headed by Kwame’s cousin John Johnson pushed it on through. Say buh-bye to another 25K of your hard earned tax dollars Detroiters! Detroit City Council’s Reaction – Video. In federal court today Judge Gerald E. Rosen was surprised to discover that unlike the proper protocol of municipal corporations, City of Detroit decided to shred official documents that should be retained. This appears a rather suspicious act on behalf of Kilpatrick’s administration,. and doesn’t help defend him in either the lawsuit regarding slain dancer Tamara Greene, nor the suit regarding his other text message scandals with Christine Beatty and investigations into misappropriation of millions of taxpayer dollars. Right on Judge Rosen! Not the least of good reasons would be: Mayor Kilpatrick’s very own policy that internal communications are PUBLIC record and subject to inspection by the PUBLIC. How curious to find that somehow, Detroit City’s communications are now magically missing and thus exempt from inspection? Well, the Judge wasn’t buying any of that argument. In response to the City’s attempt to waylay investigations saying “they can’t come up with documents because they shredded them”, the court says, “We’re going to get to the bottom of this”. (GOOD!) Further, while city attorney’s were attempting to halt proceeding of the Tamara Greene murder case due to the Mayor’s 8.4 million dollar text message scandal, federal court also denied this as well and their “gag order” request. 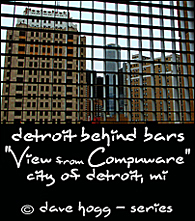 People everywhere are happy to find SOMEONE is taking interest in the corrupt leadership that has continued to occurr in Detroit which has risen to the level of making a significant negative impact upon the entire State of Michigan no less. VIDEO HERE: City Told By Judge: Delays and Gag Order DENIED and Turn Over Files! 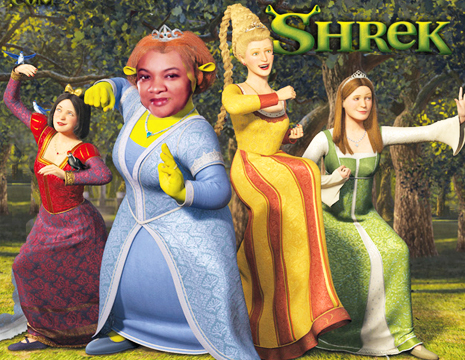 After Monica Conyers ridiculous attack on council members Jo Ann Watson, Sheila Cockrel and of course, her famous “name calling” to President Ken Cockrel that he was “Shrek”…. today she (again) appears on national news criticizing the other members of city council (again). The City Council opted to obtain Kwame’s new “expense and budget” plan for spending taxpayer funds in writing (VIDEO). Yet Monica Conyers touts to the news that this was a “bad” thing to do. However, analysts say it was in fact the most prudent thing the City Council could do under the circumstances. Perhaps Monica overlooked what the other 80,000 folks witnessed during this government address, which is that Kwame has no credibility in the first place (by his own actions indeed), and in the second place appearing with a supporter (an advocate of Kilpatrick’s who happens to also be on city council currently)—whom was dressed in a princess gown with a TIARA. Yes, on live broadcast news for the world to witness. Perhaps Monica has also forgotten that she herself was the FIRST ONE demanding the Mayor’s resignations. People are curious as to what caused Monica Conyers’ sudden, dramatic turnaround…. The City Council simply preferred to see factually, with substantiation on paper, Kilpatrick’s spending plan agenda so as to review it. And frankly, is it appropriate for someone in a professional public role to arrive with a tiara on one’s head? Is city business relegated now to a “costume” party? Let’s be honest, if any regular citizen were to walk into 5th Third Bank vying for a loan to spend the BANKS MONEY, with a tiara on their head, they probably WOULD NOT be taken seriously. Likewise, why should anyone take Kwame or his supporters seriously given the facts and history at hand? Public comment reveals that people feel the council is acting wisely to see things in writing as opposed to just hearing it and assuming it is true. After all, over 40,000 text messages show what was really going on behind the scenes. It is clear nothing can be taken for granted anymore when it comes to the Mayor, not even basic ethics. But apparently, the Mayor is still wondering why no one is interested in anything he has to say anymore and more people are calling for his resignation (VIDEO). Hmmm….after 8 felony indictments, millions of losses for the city due to his own PERSONAL spending, nepotistic practices, philandering, and mismanagement, ya think? It is also rather unfair for the Mayor to expect to be treated differently than HE HIMSELF WOULD TREAT someone who behaved as disreputably. More double standard? Everyone has seen first hand how the Mayor has mis-handled his role as a leader and violated public trust on every level. Time Magazine said 2 years ago Kwame needs to grow up. He is still not listening. Related videos on local news here. What Lou Dobbs has to share also here and via search on CNN page. His kids don’t go to any city school but to chartered schools with “white kids”. His super high powered attorney’s are all “white”, and NONE of them are from Detroit either! When presented with the opportunity to improve the schools via a generous gift funded by a common citizen who was willing to donate 200million dollars, Kwame squashed the idea and held rallies to encourage people NOT to improve education but instead be “anti-white”. Along with the other city clowncil idiot Sharon McPhail at the time (surprised?) whom further insulted the idea by publicly humiliating the donors INCLUDING African Americans by presenting them with the “Sambo Sell-out Award” on local news. See: Detroit Policies Focus On Mistreating Responsible Residents. UPDATE: New video regarding Monica’s “justification” for calling Ken Cockrel “Shrek”, now she claims she is a “feminist”. Linked below with image submission by J-Z Detroit (mashup). “…The current system is DESTROYING people…an an utter disaster with enormous profound HUMAN conequences…and the need for new thinking, new ideas and NEW solutions. …How many 8th graders will take up drugs before math and science? How many 13yrs olds will become madames (prostitutes)…? How many need to be killed and sent to prison? We have squandered education…. and dismantled the essential support systems to make gains possible. We have in effect created an unthinking, unilateral education disarmament. Is anyone HONESTLY willing to defend the current system is working?…The tragic truth is the current system is NOT working because of two topics we don’t like to talk about: BAD culture, and BAD government….These intersect to REINFORCE each other to create human and financial cost…we have a failure of government and failure of culture… leading to the rise of BIG bureaucracy combined with a rise of “counter culture” which despised middle class values that taught patterns and habits of destruction. The patterns of bad bureacracy and bad culture have led to disaster…A tragedy of American compassion. — SEE THIS VIDEO WEBCAST: Capitol Reach (What works and what DOESN’T). Unfortunately, those MOST needing to listen to this message would never consider setting aside their enormous ego’s to do so. Indeed, when citizens called City of Detroit yesterday voicing outrage the city clerk responded with “… Yeah well it was all the NEWS fault.” Should we be surprised at the utter ignorance demonstrated? Sadly for Detroit, the sheer lack of concern or integrity by those running the city is NO surprise. SOME WORDS OF WISDOM from “ExecuPundit” that perhaps the ENTIRE city government in Detroit should consider: ABOUT THE WORKPLACE PLAYGROUND . By the way, was this the REJECTION letter Monica received from her last attempt at availing a job? People wonder….. since we all know she only was appointed to this one by dropping her husband’s political name around town and bullying everyone to obtain the city council position. See also FREEP articles: Conyers Denial which includes on the right sidebar of this article the “Conyers History of Criminal Charges”.